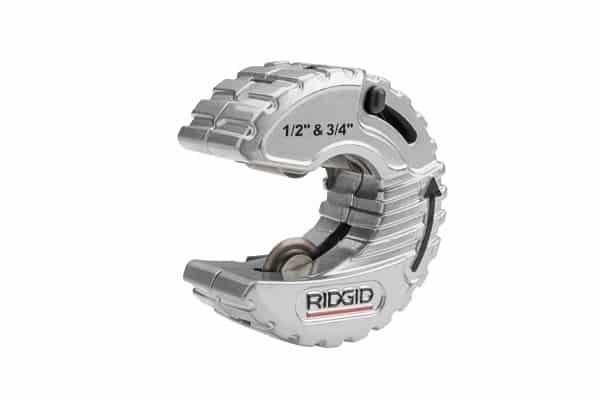 Ridgid has announced an addition to its range of high quality Ridgid tube cutters, the new C34-AU C-cutter that cuts both half and three quarter size copper tube with the flick of a switch. The cutter has a snap-on feature for a quick pipe connection and no size adjustment, as well as a spring loaded cutter wheel that provides a constant pressure on the pipe to ensure fast and straight cuts every time. Ridgid’s X-Cel Wheel Pin enables quick wheel replacement, with no tools or disassembly of the housing required. The C34-AU C-cutter also has a heavy duty construction that is housed in a zinc die cast housing, with a unique screwdriver that provides extra leverage for making cuts in extreme tight spaces.